It was another emotional day in the Big Brother 2014 house, as Derrick got word from home that his grandfather had passed away on Friday morning. It has been a rough few days for the Big Brother 16 cast and we feel for them. We also had drama at the Nominations Ceremony and a winner of the Battle of the Block determined. Check out the highlights from Friday below in our Big Brother 2014 spoilers! There wasn’t much action during the morning or day until the Nominations Ceremony. Team America was working on Zach to start a fight during his speech and they would accomplish their mission. He did attack Christine and Nicole during the speech and said some terrible things, but apparently it did not provoke them and the mission was not accomplished! They are now working him over to go after Amber at the Veto Meeting. Team America’s missions have been pointless and lame and they seem to be hurting Zach’s game, even though he does a good job of it on his own. The nominees were Nicole and Christine (Zach) and Victoria and Jocasta (Frankie). Victoria and Nicole both crying after the ceremony, but we all knew Nicotine would win (and they did) the Battle of the Block competition. Apparently Victoria had makeup on her costume for the competition and was crying about it and making a scene, which annoyed all the HGs. During the evening, Derrick was called into the Diary Room and he got the letter from his family. His grandfather had passed away and the emotions came. We had the HGs sitting in the living room in silence with Derrick for a long time and then hugs all around. He said he was here for his wife and daughter and that did not change, so he is not going anywhere. He recorded a message for his grandfather’s funeral later at night. We had some game talk and it is up in the air who the real target is for Week 5 on Big Brother 2014. It all depends on what happens today at the PoV competition. It appears that Jocasta could be going home, but then there was mention of both Amber and Caleb‘s name. A backdoor of Amber could happen, but Frankie has all these stipulations to happen for him to nominate her (the house has to be unanimous in voting her out and he has to get Caleb’s approval). It looks like Jocasta is going home, unless someone wins veto and takes her off the block. 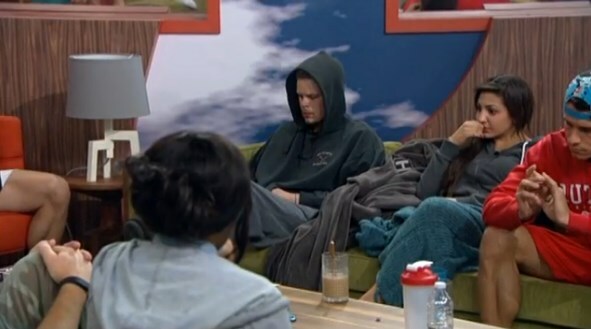 Derrick and Cody are worried about Zach and their alliance with him. Everyone thinks he is a loose cannon and no one trusts him, but they keep him around? I think he could make a big move down the road if he sticks around that long. We also saw Caleb talking about his dream world that he lives in. He thinks he will be big and famous once Big Brother 2014 is done. He talks about his family having a TV deal with TruTV, but it fell through. Another network picked it up, but they dropped it too. He was supposed to be on The Bachelor, but he wasn’t stable enough for it (yeah, we can tell). And he wants to have a show afterwards of him going around the country in a limo and taking women out on dates, like he is their prince showing up! Come back to our world Caleb! Today should be good, as we have the Power of Veto players being picked and then the competition and finally we can have an idea of where Week 5 is headed! It drives me crazy when they say they need someone elses approval to backdoor someone. Especially Calebs concerning Amber! And WHY does the vote have to be unanimous??? Can’t these people think for themselves? ?…..I already know the answer to that one…..No, they can’t. They are afraid to vote against the house. At this point i’m rooting for an all male F4. The girls are so weak it’s almost embarrassing. Calebs obsession with Amber is bad enough but his delusions of grandeur will also be hard to live down once outside the BB house. You left out he was supposed to be on Survivor. Yeah, according to him he had to choose and chose BB instead. Actually , the only way he will be getting a date after this is IF the network decided to follow his premise and send him around the country doing so in his limo. Unfortunately for him, it would also be the fastest show ever to be cancelled on t.v. due to lack of participants. Even the Sock Monkey would refuse. It IS very embarrassing the way these women are behaving. Like I said earlier, they treat it like a social, country club. I didn’t know Caleb was supposed to be on Survivor – I bet Jeff is feeling very relieved he chose BB. I’m not even sure that was true or he was making it all up in his head. At this point, i think he believes everything that comes out of his mouth is the gospel truth. He has to be one of the most delusional people to ever enter the BB house. I was married to a man like that (stupid me). Run Amber, run! Oh yeah, I forgot about Survivor too….nutso! Yea what is up with the sock monkey anyway. Where did that come into play? I still remember last year’s house following like sheep too. Did everything McCranda wanted – much to my frustration – until the numbers dwindled and someone was able to take Amanda out. I still say that the only time in BB past that any house-tipper did damage early in the game, either (a) they already had a target on their back and wanted to go out with a bang, or (b) they moved too early, put a target on their backs, and were voted out two weeks later (the first time they couldn’t win HoH or Veto). Very few have successfully flipped a house to save themselves. A couple women lasted longer because they had a male partner who sacrificed for them. That said, if I weren’t under the influence of Derrick’s Dust so far this season, I would normally be right there with all of you, desperately hoping someone sacrificed themselves on the alter of drama so we BB fans could see a more interesting show!! JMO…. The show gets boring when one person is basically picking off the enemy one by one. Even if the house-tipper ends up evicted, it gives us a bit of excitement if just for a little while. I hate predictability. Zach told Derrick and Frankie last night that if Donny got HOH he would put them up. Which led Frankie to think about putting Donny on the block unless he wins veto. Not sure if he would actually do it right now but Zach put a target on Donnys back. I was hoping he would keep an alliance with Donny but he has proved he won’t. Donny would be about the only one at this point that would be a house-tipper. So his eviction would probably mean a clear path for the Detonators to slide into F5 without a problem. This is a very uninspiring year. I agree. Even if Derrick succeeding doesn’t upset me like McCranda did last season. I just still hope Donny or the other side of the house wins hoh at least once. Soon! Or it really could be predictable to the end. I still believe things will shake up soon! OMG Derrick is head and shoulders above McCranda. Their game was bullying. He at least has some strategy. Even if it’s not the kind that’s at the top of my list for likeability. I read the other day that Zachs Dad tweeted that he got a call from Amanda asking if Zach would take her on the Germany trip he won. I’m sure it horrified him at the thought of Zach being alone with this…woman. OMG seriously Cat. Now would that not be a site. it is crazy how both of their grandpas died while they are both in the hoouse. I agree Tommy. Good morning everyone. Zack should not be here in the first place…….. He is a loser. I hope he gets backdoored soon.